Take a stroll with me in my family’s garden. There are subtle steampunk elements infused throughout the lush pachysandra and fragrant lily-of-the-valley and get some ideas for your own steampunk garden! Here is the house, sheltered from the summer sun by large trees. 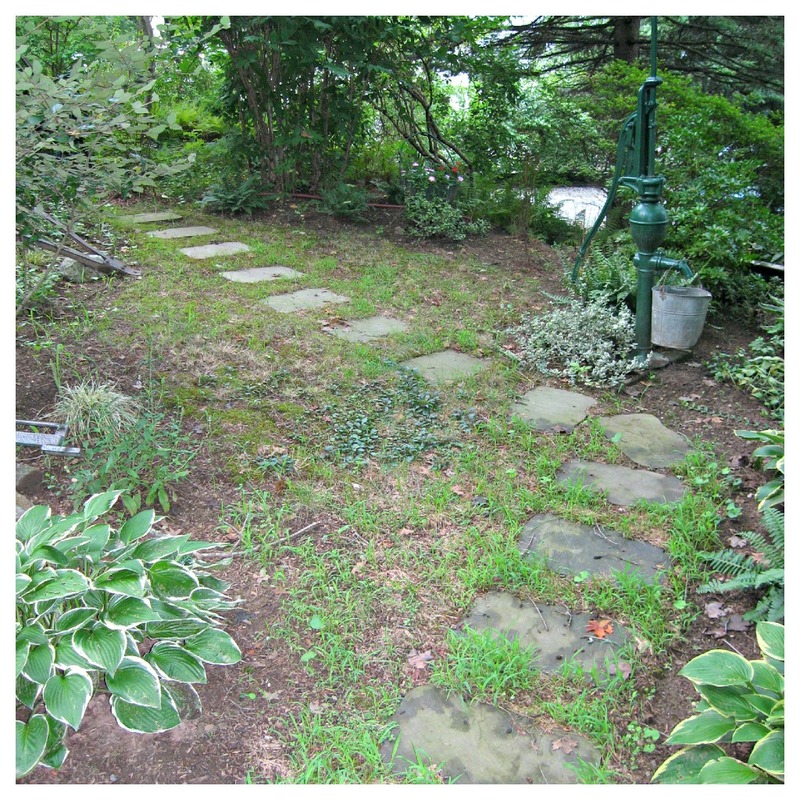 Stones line a path along to the driveway off to the left which takes you past an antique water pump (painted forest green) with a tin milking pail hanging from its spout. 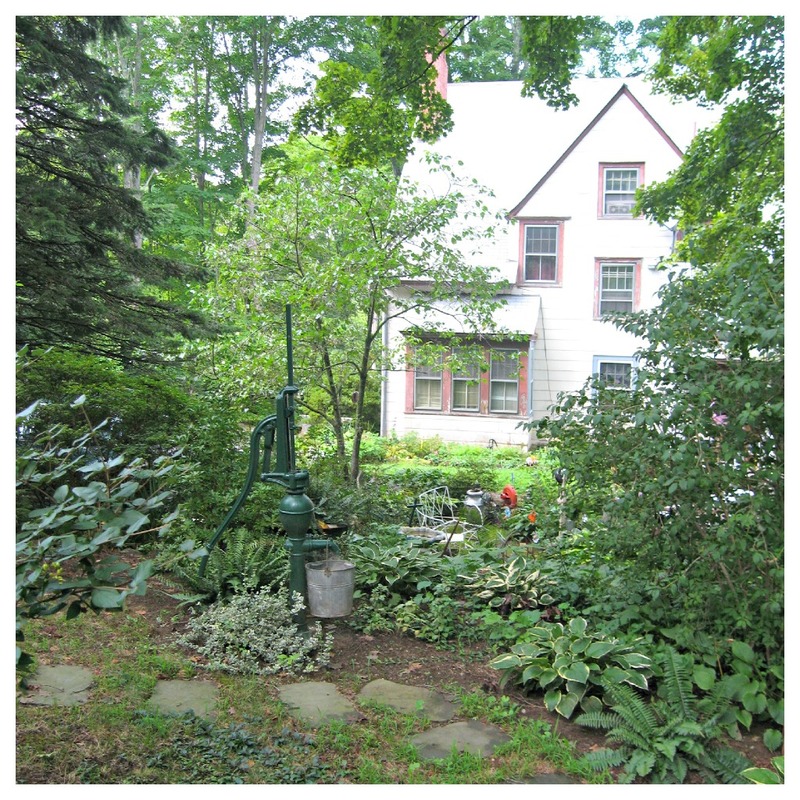 Water pumps are a frequent fixture in our garden & yard–and are painted a variety of colors, from forest green to deep purple. 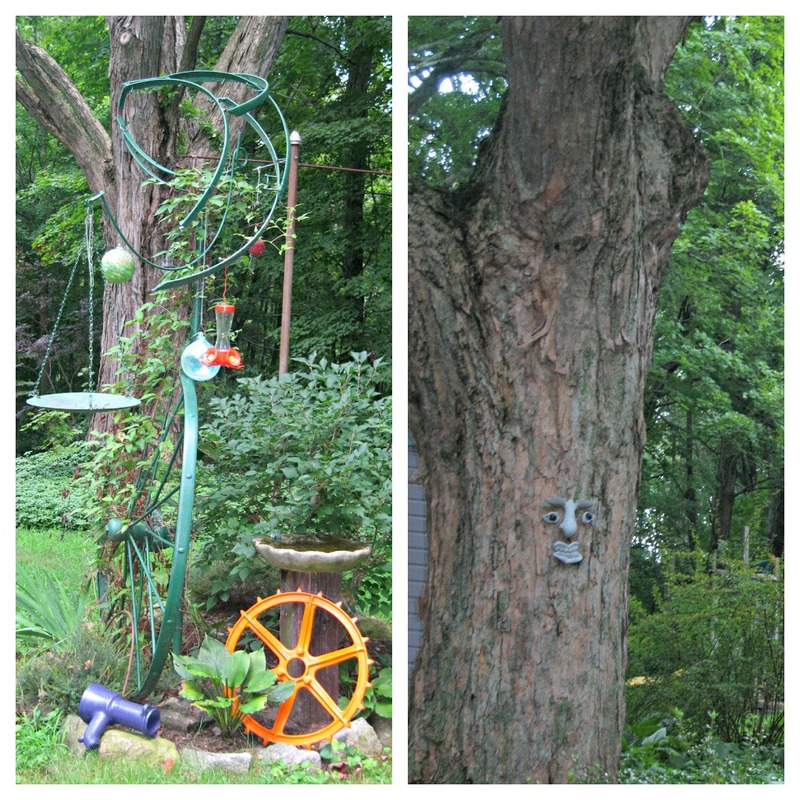 Old farm equipment is also good for decorating your garden–the piece on the left was used for pulling tractor chains. You can leave the old equipment rusty for a more vintage look or finish it with a coat of paint to complement the colors of your flowers or other flora. Another great piece is the metal sphere inside of (or sometimes on the outside of) a globe (pictured bottom right). Birdbaths are also a must! No steampunk garden would be complete without gears! Pictured on the bottom below are two large gears painted mustard yellow and hidden in the deep foliage. Painted, they offer a hint of color that accents the yellow of the leaves. Above is another gear, unpainted, to match the Northwest Engineering Company metal sign. 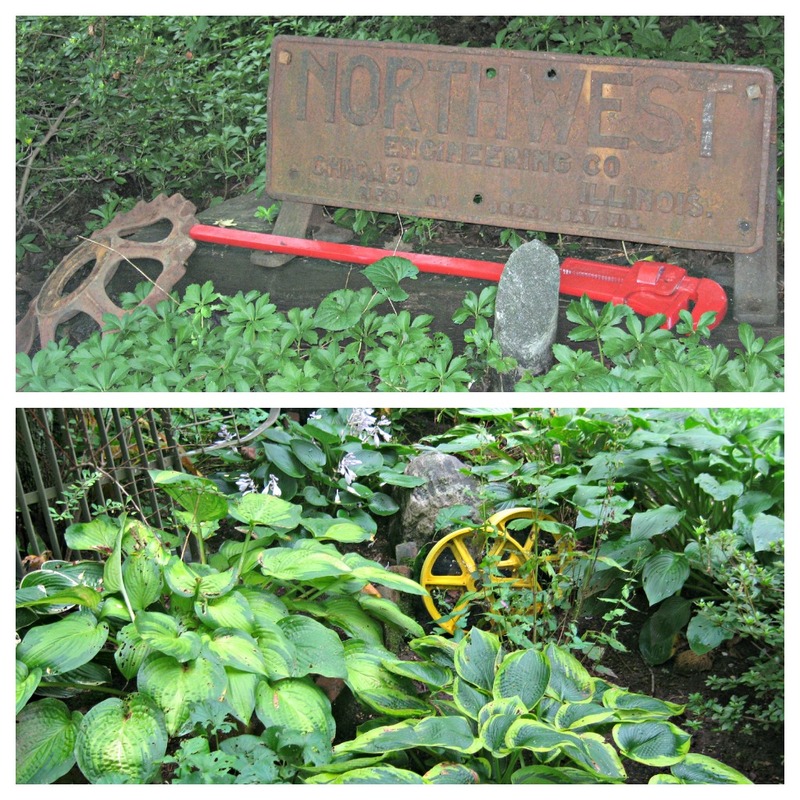 Antique metal signs & business plates are another great way of giving your garden a steampunk feel. 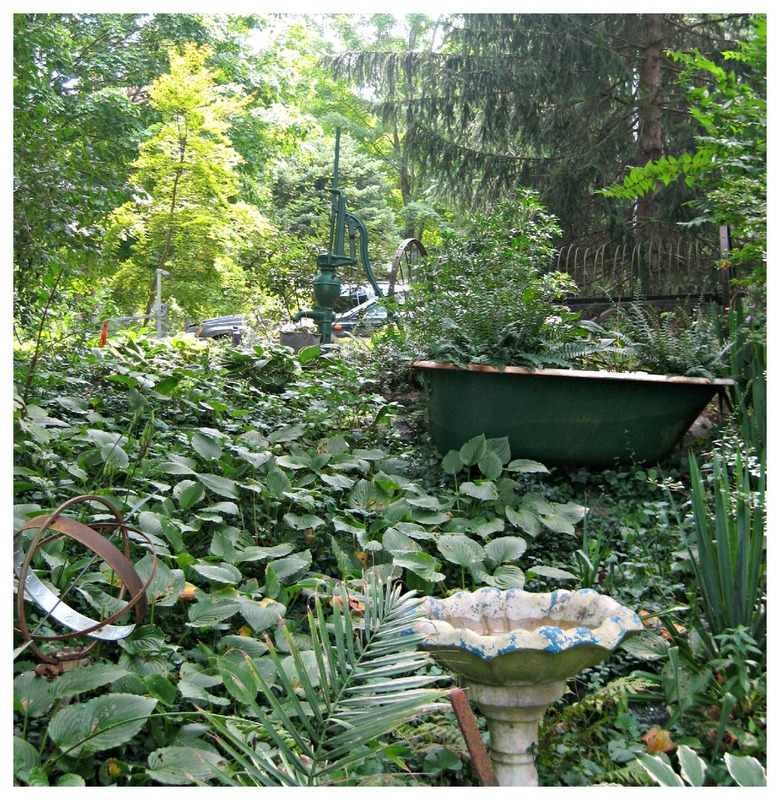 Here you can see the placement of the birdbath, globe sphere, and water pump in relationship to the landscape. Also, antique bathroom fixtures make wonderful planters. 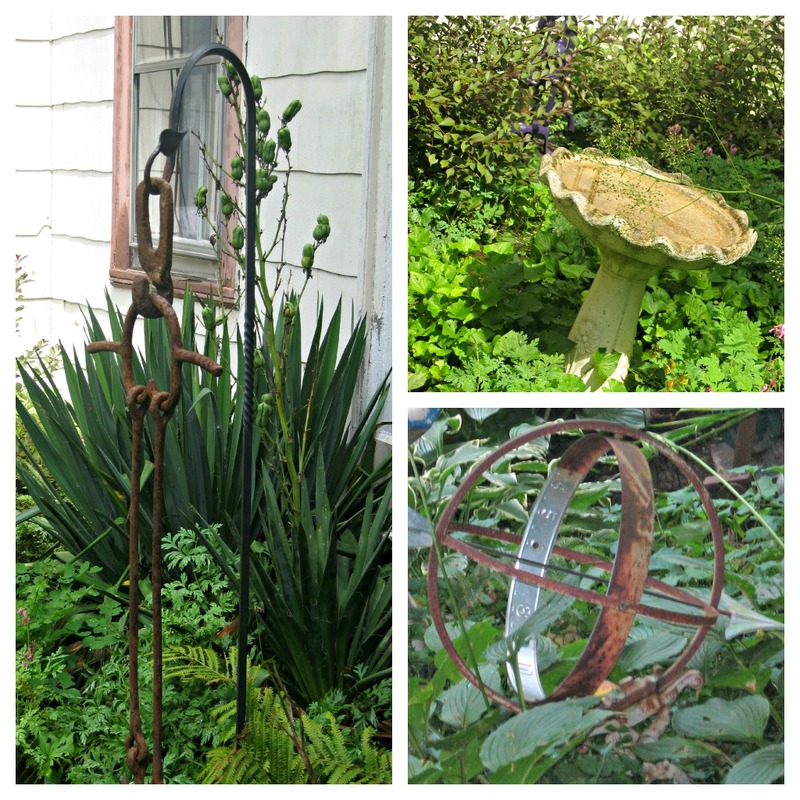 Worn out tools are another fantastic source for garden decoration. Here we’ve used an anvil and a large rusted-out wrench. 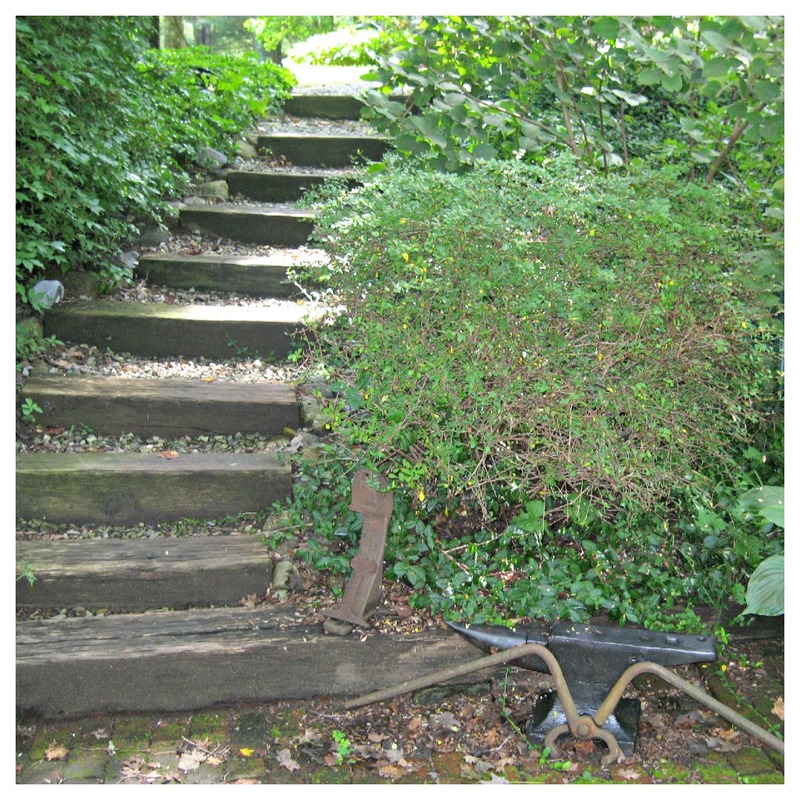 It’s perfect to place along steps. Among my favorite parts of our garden is the birdhouse structure my uncle made for my grams. 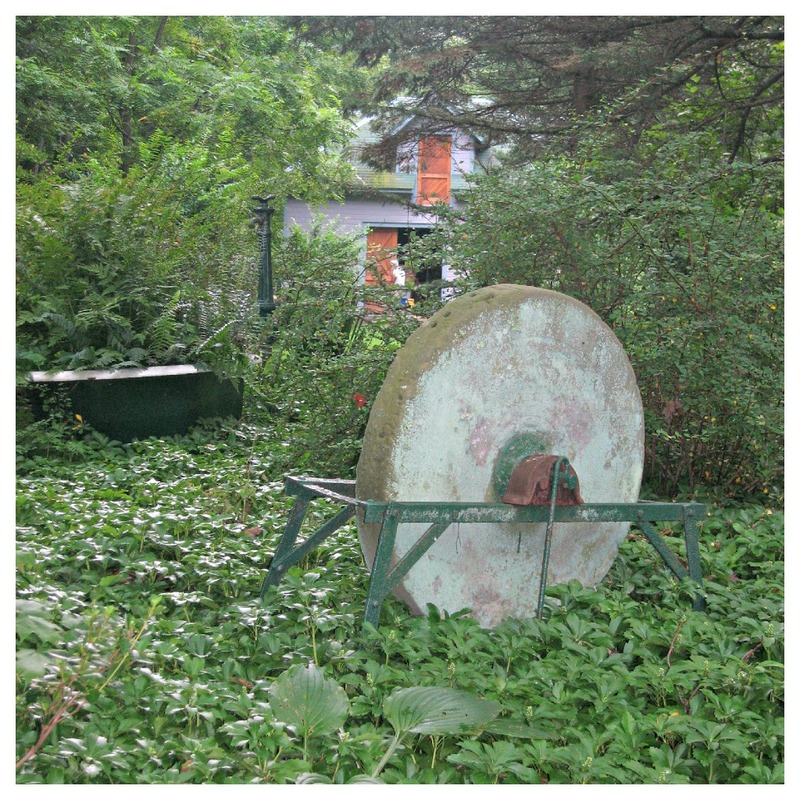 He constructed it out of an old hayrake (the top) and a wagon wheel–both painted forest green. From the old blades hangs grams’s many birdhouses & feeders. Pictured right is an important feature, every garden should have its own magical creature for the kiddos! Ours is an Ent. What I love about our garden & lawn is the variety of flowers, plants, and trees. 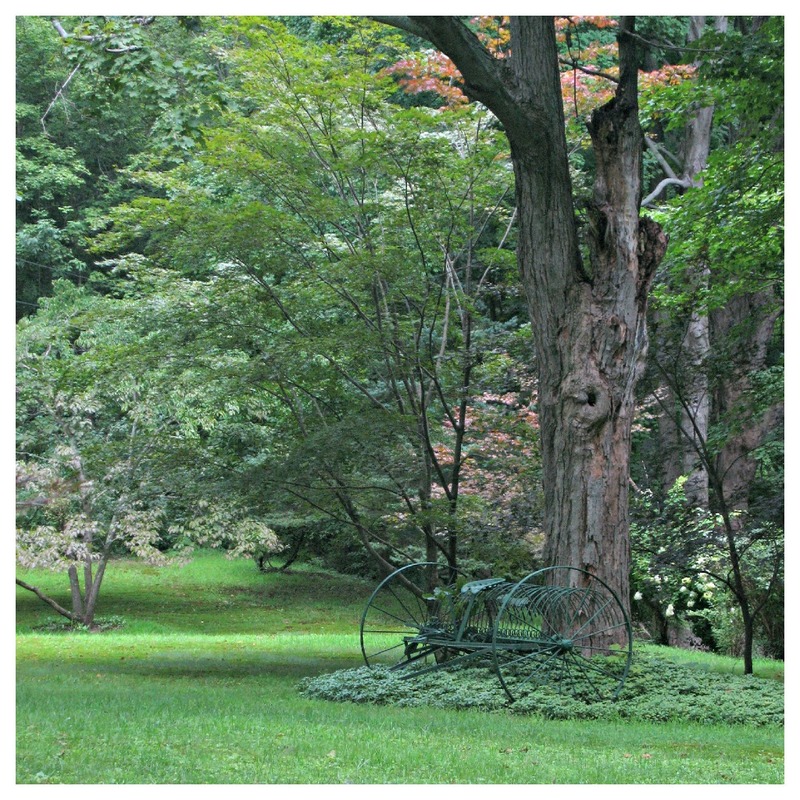 My Uncle John is the landscaper & gardener in the family and if you are looking for gardening tips to recreate a Victorian-style garden, check out Old House Journal’s summer & spring issues for gardening tips. This OHJ article offers some advice on planting Victorian flower beds. Thanks for taking a stroll with me! I am certainly enjoying a reprieve from the desert-heat of Oklahoma here in New York. Hope you are staying cool wherever you are!